Entspannen und genießen Sie die Ruhe unserer Ashley Seeufer Kabine Rückzug. Cozy Lakefront Kabine in einer geschützten Bucht von Ashley See im schönen NW Montana. Zwei Schlafzimmer und ein Loft für einen perfekten Familienurlaub; bequem schläft 8. Entspannen Sie sich in der frischen Bergluft und genießen Sie die spektakuläre Aussicht Montana von der großen Terrasse. Internet (30 MB), Satellitenfernsehen, PS2, DVD und drahtloser Verizon-Telefondienst. 2 Kajaks, Paddelboot und Ruderboot (zusammen mit Schwimmwesten). Andere Wasserfahrzeuge für die Vermietung separat erhältlich (Motorboote, Jet-Ski, etc.) Wandern, Angeln, Schwimmen, Huckleberry Kommissionierung, und den Rest der spektakulären Angebote Nordwesten Montanas zum Genuss. Kokanee Cabin is super! With all the comforts of home, like washer/dryer, full TV service and internet, and all the boats and gear we needed to fish and play in the lake at the ready. Even a paddleboard. Wonderful dock. Great beds, lots of extras inside...and firepit, etc. Great view of the water from inside and from the big deck. Quiet and peaceful with deer wandering by. Thanks to the thoughtful hosts Diane and Blake! the cabin was great but the lake was even better. Perfect cabin on the most stunning lake! Thanks to Blake and Diane we had the most amazing vacation at their cabin. They were more than accommodating and provided everything you would need to feel at home. The lake is truly stunning and warmer than we thought it would be. Perfect for swimming! The color of the lake is indescribable! Very quiet and private. Perfect to decompress. So blessed to have gotten the opportunity to stay. We can’t wait to go back! What a wonderful place to spend a week! The cabin is really nicely furnished and in a wonderful area. The owners are fabulous people, really friendly and accommodating. We would love to stay here again in the future. 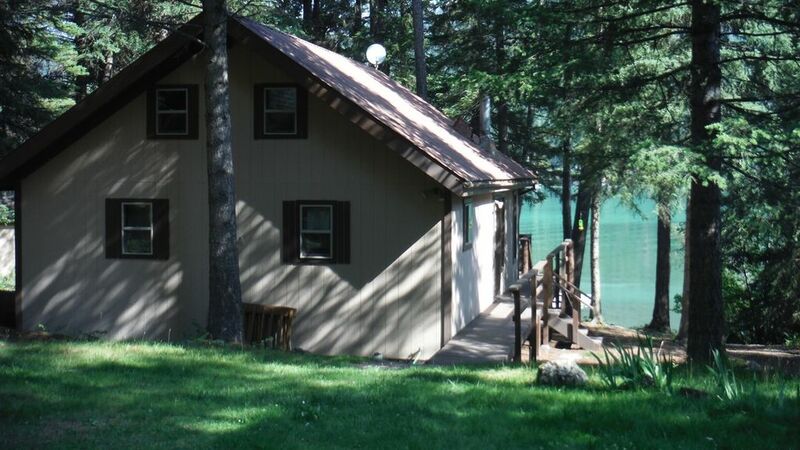 The house was exactly what we wanted: clean, comfortable, and in a setting on a private lake. We had such a fantastic vacation renting Blake's house for the week. From the start Blake was so helpful of any questions we had upon making the reservation and through the whole time of our vacation. He went out of his way to supply our family with enough fishing poles and life jackets during our stay. The house was very clean and perfectly comfortable for our family of 6. Our kids enjoyed themselves so much with fishing from the dock, pedal boating, swimming, and their favorite :kayaking around the calm, private lake. Our oldest daughter also enjoyed reading in the hammock to get away from the younger kids at times 😊򒠠We had never rented a home before and were a bit skeptical of Internet scams at first but this family experience with the house and the perfect lake setting along with Blake's way of going the extra step for us made us believers we will be definitely making a return visit in the near future. Thank you again Blake! The stay was perfect! The cabin had all the amenities and an amazing view. We really enjoyed the location and wildlife. We can't wait to return! Rates subject to change until reservation is confirmed. 10% Discount for returning guests. Please remind us of your previous stay when booking.